If your textbook has a diagram like this, you may need a new textbook. This shows the evolution of hoofed mammals since the end of the Cretaceous (about 65 million years ago). A generalized bunch of mammals called "Condylarthra" spits off several radiations before it goes extinct: Artiodactyla (even-toed ungulates: pigs, hippos, camels, ruminants, etc. ), Perissodactyla (odd-toed ungulates: horses, rhinos, tapirs, etc. ), Tubulidentata (aardvarks), Hyracoidea (the superficially rodent-like hyraxes), Proboscidea (elephants, etc. ), Sirenia (manatees, dugongs, etc. ), and some extinct groups like Desmostylia and a large South American group. At least one of these radiations, Artiodactyla, spits off its own new radiation: Cetacea, the whales. This diagram nicely shows population changes over time and is pretty instantly comprehensible. Unfortunately, it's also wrong, WRONG, WRONG. First of all, it obscures the actual relationships of the "parent taxon" to the "daughter taxon". Obviously, some "condylarths" will be closer to one or more of the "daughter taxa" than they are to other condylarths. Why lump them in with organisms they share less common ancestry with? The group "Condylarthra" is simply unnatural. "Artiodactyla", as shown here, is unnatural, too—hippos are probably closer to cetaceans than they are to other artiodactyls. Furthermore, recent molecular studies have shown that "Ungulata" is not a natural group. 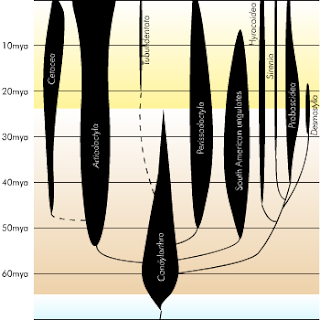 Some of these lineages—Hyracoidea, Proboscidea, Sirenia, and Tubulidentata—are part of Afrotheria, an endemic African clade including golden moles, tenrecs, otter shrews, elephant shrews (sengis), etc. Perissodactyla is allied to Ferae (carnivorans and pangolins), and Artiodactyla is allied to a group including Chiroptera (bats), Ferae, and Perissodactyla, which was rather creatively named Pegasoferae ("Pegasus wild beasts"). In short, "ungulates" are not a phylogenetic group, but more of a general ecological form, one which several placental lineages arrived at independently (and some, like cetaceans and sirenians, secondarily lost as they became aquatic). There is no such thing as one "origin of the ungulates"—there were many such origins. Under newer paradigms, we don't think of higher taxa as bubbles that spit off other bubbles. Instead, higher taxa are clades: an ancestor and all of its descendants. Artiodactyla did not spit off Cetacea; instead, Artiodactyla includes Cetacea. Cladogram showing the distribution of hooves among extant placental mammals. Some of the particulars remain under debate, but the picture is becoming clearer. What about the condylarths? Work is still going on to see how these fit into the newer ideas about placentalian phylogeny. They are probably an unnatural group with multiple origins. One recent study suggests that some may not even belong to the crown group—they may be stem-placentals, on one or more side-branches to Placentalia. Understanding phylogeny is crucial to investigating questions about the history of life. For example: what caused the mass extinctions at the end of the Cretaceous? This is a question which has received a lot of attention, both scientific and popular. To even begin to answer this question, we have to know which groups of organisms perished and which made it through. Specifically, many researchers are curious as to whether a given diverse crown group started to diversify before the extinction, or survived as a single lineage which diversified afterwards. As an example, there is evidence to suggest that the crown group of birds had started to diversify earlier, with at least six lineages surviving into the Cenozoic (the current era). Obviously, one such group of interest is Placentalia (all researchers being lifelong members). Did a single lineage squeak through (ha ha!) by the hair on its chin (my sides!) to give rise to atlantogenates and boreotheres later, or had placental mammals already begun to diversify before the mass extinctions began, at the feet of the dinosaurs? Earlier this month (a day before my birthday, in fact), a paper was published which tentatively suggests the latter case: placentals diversified before the extinction. Titled A Cretaceous Hoofed Mammal from India, it names a new species, Kharmerungulatum vanvaleni, based on a single lower molar. As this molar shows similarities to those of Protungulatum, an early condylarth, K. vanvaleri is assigned to Condylarthra. The authors suggest that this may mean that the ancestors of ungulates had diversified before the end of the Cretaceous, perhaps especially in Gondwana. To me this is a clear example of the dangers of "bubble-thinking". Phylogenetic research has shown us that "ungulates" are not an evolutionary unit. Hence, the "ancestors of ungulates" are really "ancestors of placentals". Furthermore, it may be that Protungulatum is part of a side-branch to the placentals, so if this new Indian taxon is closely related to Protungulatum (and even that evidence is scanty), then it may not even be a placental. All this tooth really tells us is that some therian lived in India toward the end of the Cretaceous. And that has no bearing at all on the question of whether placentals originated during or after the Cretaceous. However, if Kharmerungulatum does share a clade with Protungulatum to the exclusion of placentals, then it would be part of another clade that persisted across the boundary, but died out soon thereafter. Why did this clade and the ancestors of placentals survive? Why did placentals win out in the aftermath? Perhaps this new taxon can help us answer these types of questions, which come from a "tree-thinking" perspective. Of course, so far, Kharmerungulatum is just a tooth—but maybe more material is out there. 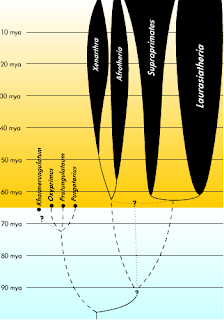 Phylogeny diagram showing major placental groups and some "condylarths", including a tentative position for the new taxon. The Cretaceous/Paleogene extinction occurred at the color boundary, about 65 million years ago. I didn't get into that issue (or a few others), because it wasn't directly relevant to my main point, that "bubble-thinking" leads to faulty conclusions, and "tree-thinking" is vastly preferable. See the Hallström et al. citation for the support for Atlantogenata—apparently that study uses more molecular data than any other such study. I'll definitely check out your link as well. For me the jury is still out on molecular phylogenies of mammals (or molecular phylogenies in general for that matter): there's too much confidence in raw molecular data and too little analysis of organizational patterns in DNA sequences, AFAIK. I think the man has a point, what with a degree in biochemistry (or a close enough discipline). The references for that Philippic are 5–12 years old, which is a pretty long time for this area of research. People have been looking more at the organizational patterns of DNA. Of course, there's still huge loads of work to be done, but I don't agree with this despairing tone. Really, the jury's still out on all phylogenies, whether based on molecules or morphology. As always, the cladograms we use are the best approximations currently available, not the final answer. Who knows. Toxodon and Macrauchenia survived till very recently. People haven't even tried so far. Most of the cladogram, including Pegasoferae, is based on LINE insertions. This is a quasi-morphological character that is almost completely immune to homoplasy. That's something we can really trust. Unfortunately the paper in question didn't have any xenarthran or pholidotan data. Update to my own comment... protein sequences have been obtained from 2 or 3 South American "ungulates"; they're close to Perissodactyla. LINE insertions actually show incomplete lineage sorting; the phylogeny of Scrotifera isn't entirely treelike.